A new face at Eziko | Welcome to Fairview's Blog! In September 2008 Fairview entered into a relationship with the Eziko cooking school in the township of Langa, outside Cape Town. 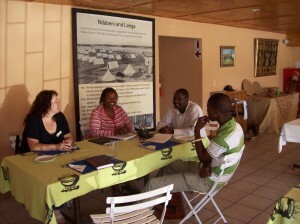 You can read my posts about our first trip to Eziko and the students return trip to Fairview on the highlighted links. Winston Zakhe has been in touch with Victor Mguqulwa at Eziko with regard to our plans for 2009 and I caught up with him to hear about developments. For the past twelve years Eziko has been offering youngsters straight from Matric (final year of high school) an opportunity to train as chefs. Having been approached by the school, we joined up to partner the school and help the would-be chefs with basic wine education. This year the group of 15 students will spend a day at Fairview with wine and food as the theme of their “enlightenment trip”. Yesterday was another milestone in the partnership. Fairview will be sponsoring a student to attend the school and a young man from Fairview’s farm community, Bonga, will be joining Eziko this year. Winston and Lisa Mason (Fairview’s community development worker) travelled through to Langa with him to meet with Victor and introduce Bonga to the school. Partnerships are vital to the effective functioning of an initiative such as Eziko and some of these include kitchen placements at Grand West Casino, Cape Manor, Winchester Mansions, The Cape Town International Convention Centre and the Table Bay Hotel as well as a partnership with the Pick n Pay cooking school. Victor was beaming as he told of how his proudest moments are to hear from these establishments that his students are more than able to compete with those from South Africa’s more established and renowned schools. We are truly happy for Bonga, a very promising young man and we wish him well. We will certainly be there all along the way in his quest to be a great chef. Perhaps he will be back at Fairview adding value to our own Goatshed restaurant when he finishes his in-service training. We look forward to hearing about his experiences and progress. Thanks to Winston and Lisa for their efforts and contributions. On behalf of Eziko Training School we would like to thank you for your ongoing support. Our students had a great exposure on wines and cheese while visited your estate last year, we do appreciate your input. The meeting we had with Winston and Lisa was great, it gave us an insight and good advice to take Eziko forward. We appointed a new trainer Junaid De Villiers from Prue Leith College assisted by our graduate student Lindile Khedama to improve the standard. You will meet them when students visit your institution in March. We would like to learn more from you and share ideas. As we focus on poverty eradication we can’t do this alone we need your support to mentor us. Thank you, we will forward full programme by next week.